Weighing in at 672 pages, Brandon Sanderson's first short fiction collection not only pulls together various short stories and novellas from across his Cosmere, but organizes them by Shardworlds, complete with essays and illustrations on each. 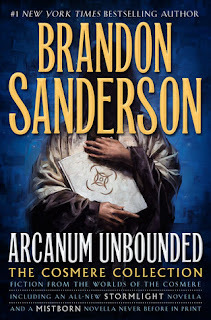 Arcanum Unbounded is a collection that would no doubt be daunting to a new reader, but which rewards the faithful with an even deeper understanding of his creations. The collection opens with a pair of stories set in the world of Elantris, with “The Emperor's Soul” serving as a standalone tale, and “The Hope of Elantris” taking place following the original novel. Soul was the one story in the collection I had read before, and it was just as fascinating the second time around. As for Hope, it will have to wait until I read the source material, since it contains major spoilers. Not surprisingly for his longest series to date, Mistborn gets three entries here. “The Eleventh Metal” was a pleasant surprise, being a prequel to the series with my favorite character, Kelsier. As odd as it was to see him so early in his career, it was also interesting to get some more insights into his tortured past. “Allomancer Jak and the Pits of Eltania, Episodes 28 through 30” was, by far, the most entertaining story in the collection. Written as a pulp adventure tale, what really makes it work is all the footnotes from the fictional editor who is forced to publish such nonsense. “Mistborn: Secret History” brings us back to Kelsier, following the events of the first Mistborn novel. It was an interesting story, with some entertaining moments, but I've never been a fan of stripping a character of his powers and taking him out of his element. “White Sand" was a fascinating treat, offering up a sample of the graphic novel on which it's based (which is awesome all on its own), and then pairing it with the short story from which it originated. "Shadows for Silence in the Forests of Hell” is another standalone story set in its own world, and probably the darkest piece in the collection. It's a story of haunted forests, human cruelty, painful secrets, and the undying thirst for revenge. As far as the new material here is concerned, this was probably my favorite. Ironically, the next entry - “Sixth of Dusk” - was the only story that didn't work for me. I can't put my finger on what was wrong with it, but the story just never grabbed me. The self-professed crown jewel of the collection, "Edgedancer," is an all-new Stormlight Archive novella that I am pleased to say was everything I was looking for. It's a great story that gives us a peek at another part of the world, and which looks at the magic of the world from a younger, less experienced perspective. It's a story that blends sorrow, awe, and humor in equal measure, revisiting the character of Lift, who first appeared in Words of Radiance. Even if you've read some of the material before, the packaging of Arcanum Unbounded makes it a must read. Each section of the book has an illustration of the solar system in which it takes place, with the character of Khriss (who has written the Ars Arcanum at the end of each novel) providing a short essay on the world. Each story gets an illustration to introduce it, along with a Postscript from Sanderson, explaining how it fits into the Cosmere, why it's important, and how it came about. While it's not a good place to start for new readers, it's definitely a treat for fans. With Thanksgiving coming up fast, my reading has ground to a halt but I'm in the middle of this now and loving it.